The feet are daily much exerted and often suffer from various health complications. Many people have problems with hard skin of the heels, frequent callosity, increased foot perspiration and bad foot odour. Most problems appear from spring till autumn, when the temperature is higher, so the feet sweat, which supports a higher reproduction of bacteria, yeasts and various fungi. Then a small injury will start a number of problems. These products should become a common equipment of bathrooms and should be used in everyday care of the feet. The balm is intended for softening and moistening the hard skin of the feet, hands, knees and elbows. It quickly absorbs, moistens and softens the skin efficiently. It protects the skin from desiccation followed by hardening and peeling. 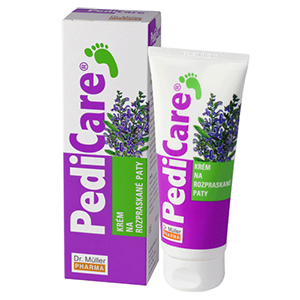 PediCare® balm for hard skin should be applied on well-washed and dry spots several times a day and gently rubbed in. This regeneration cream is intended for fissured heels and skin of the soles. It greases well the skin and softens the layers of fissured skin. If used regularly, it returns the natural elasticity and resistance to the skin. It protects from drying the heel skin and prevents fissures and related unpleasant manifestations. Pedi-Care® Cream for Fissured Skin should be applied daily on well-washed and dry feet, best before going to sleep, and gently rubbed in.